Armed with over 20 years of culinary experience and a firm knowledge of traditional Chinese cuisine, Malaysian-born Chef Andrew Chong helms Racines Chinese culinary brigade, leading a team of passionate chefs, who all share the same passion for gastronomy and authentic Chinese cooking. With an aptitude in presenting memorable culinary experience to all who dine at the restaurant, Chef Andrew maintains a hunger for elevating his skills and delving deeper, exploring new elements and ingredients so as to keep his dishes contemporary and exciting yet true to its humble heritage. Lap Mei Fun, or Chinese waxed meat rice, is a simple and delicious one-pot meal that’s commonly had during the festive season. 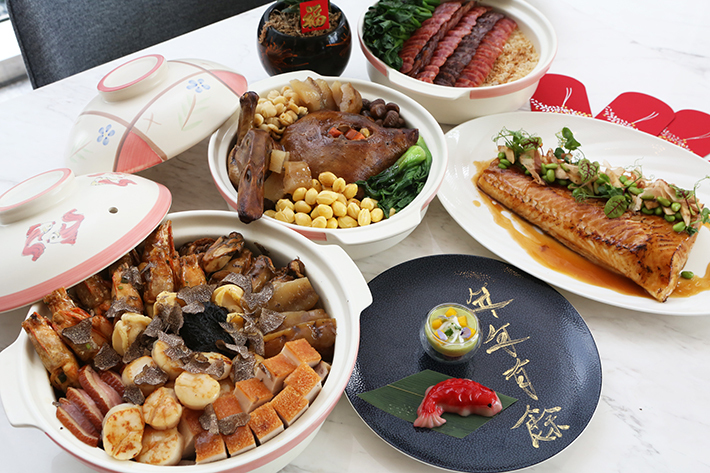 Chef Andrew’s version, his Claypot Rice with Selection of Premium Waxed Meats and Chinese Sausage (S$98++), comprises a mixture of waxed and cured meats such as Lup Cheong (Sausage), Lup Yoke (Pork-belly) and Yun Cheong (Goose Liver Sausage). The secret to this dish, albeit simple in its ingredient list, lies in the flavourful fats of each individual meat product which imparts all its aromatic goodness onto the rice during cooking. This dish yields a fragrant, meaty savouriness sans the smoky element and comes with generous slices of sausages, neatly arranged over top. A dish that’s hugely popular in Hong Kong and one that has become synonymous with Chinese New Year celebratory feasts here in Singapore is pen cai. Pen cai is a traditional Chinese dish that consists of several premium ingredients such as seafood and meat that is typically eaten during important occasions. While purists may argue that this dish is merely a big pot of fancy ingredients thrown together and topped with sauce, Chef Andrew takes it up a notch by preparing each and every component—from the seared Hokkaido scallops to the blanched napa cabbage—separately, treating every ingredient with the respect that it deserves. Chef Andrew Chong’s Pièce de Résistance features a multitude of premium ingredients such as abalone, sea cucumber, king prawn, Hokkaido scallop, fried oyster, fish maw, roasted duck breast, roasted pork and more! When it comes to ladling over sauce, he is careful not to overdo it so as to preserve the textural integrity and natural flavours of each ingredient from the crispy pork belly to the tender scallops. The cherry on top? This luxe version is finished with a generous shaving of black truffle over top. Now if that isn’t the epitome of luxury, we don’t know what is. Fuelled by his fountain of knowledge in traditional Chinese cooking, Chef Andrew’s Claypot Royale Braised Duck with Sea Cucumber (S$168++) is one mammoth-sized festive centrepiece that begs to be devoured (and photographed). Stuffed abundantly with lotus seeds, gingko nuts, diced carrots and braised chestnuts, the braised duck achieves a profound sweetness that bolds well with the subtle gaminess of the duck. The pot is packed generously with a multitude of edible goodies and will prove itself a crowdpleaser at any reunion dinner. Firm and robust in texture yet delicate, almost cream-like in flavour, we could hardly stop ourselves from reaching in for seconds when it came to the Baked Caramelised Black Cod Fillet with Soy Glaze, Edamame and Bonito Flakes. The soy glaze painted over gave the fish a savoury depth and the bonito flakes provided a hint of umami which contrasted the creamy fish very well. Exquisitely constructed, the Chilled Avocado with Shredded Coconut and Steamed Koi Fish Nian Gao is just too gorgeous to consume. The koi fish nian gao was tacky and tasted oddly similar to the traditional rainbow lapis we grew up with and the chilled avocado was both light and refreshing. Orders may be places at Racines or online via Boutique Magnifique. Pre-payment is required for orders to be confirmed and processed. No refunds are allowed for missed pickups. Collections are made between 11am – 6pm. Please allow a min. of 3 working days between confirmation of order and pick up. Last orders will be on Wednesday, 20 February 2019. Last day of collection will be on Friday, 22 February 2019. Discounts and promotions are not cumulative and not valid with other special offers. All prices are in Singapore dollars and subject to 7% GST. This post was brought to you by Sofitel Singapore City Centre.